How can we develop new energy carriers that surpass fossil fuels? How can we build new drugs to cure cancer, or design biomaterials that can replace human tissues? Is it possible to fabricate coatings capable of self-repair, or dynamic plastics that self-decompose? To take on these challenges, scientists must develop and study innovative materials at many levels from the very smallest, the individual molecules, to the very largest, the materials in their totality. The ICMS/lab has all the equipment this requires. Thanks to the ICMS/lab, scientists at TU/e have developed synthetic proteins that inhibit ice recrystallization. These could provide an environmentally friendly alternative to the poisonous and highly flammable antifreeze products currently on the market. Water-soluble biomaterials that can be used to repair broken joints have also been developed by the researchers. A coating on these printable materials attracts cells to grow new bone tissue. Researchers at the ICMS/lab continuously develop and seek new measurement tools to clarify important fundamental questions. The greatest challenge is to accurately map the structure and dynamics of complex materials simultaneously and in a non-invasive manner. This requires precise and reliable measurements of both rapid and slow processes, of systems in and out of equilibrium, at all relevant length scales from the very smallest, the individual molecules, to the very largest, the materials in their totality. 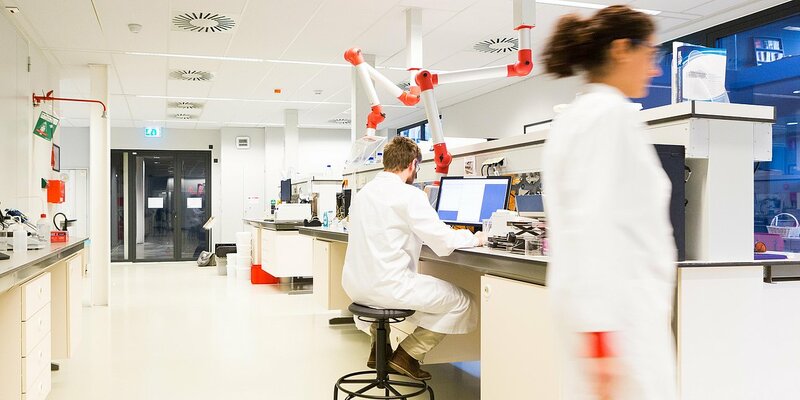 For constructing, measuring and, where necessary, improving innovative materials from a molecular perspective the laboratory offers state-of-the-art instrumentation. While many laboratories focus on one of these discrete steps, the ICMS/lab offers researchers the tools for the entire development process. Among its facilities, the laboratory offers high resolution microscopy, light- and X-ray scattering, various systems for surface analysis, and microreactors. In such microfluidic reactors chemical reactions occur at the microscale, for example in the case of testing blood for diabetes in a lab-on-a-chip. The laboratory's X-ray scattering equipment (SAXS) enables researchers to zoom in on the structure of both biological and synthetic materials. In this way, they can examine how the material is structured and can check whether it meets the intended requirements. This instrument is not available at any other university in the Netherlands. The ICMS/Lab is part of the Institute for Complex Molecular Systems (ICMS), a TU/e research institute in which various departments are clustering their strengths. As researchers from different fields meet in the laboratory, unique connections are made and fertile ground is created for serendipitous cooperation and innovation. While the laboratory is not available to external parties conducting their own research, cooperation with external research partners is welcomed. For example, TU/e researchers collaborate with industrial parties such as Clariant and DSM, as well as with spin-offs like SupraPolix and SyMO-Chem. Those interested should contact Ilja Voets.